After coming through tougher times, Royal Portrush is primed to front a new era for Irish golf. The42 meets the man at the centre of the club’s successful bid to stage the game’s most illustrious tournament. A new era for Royal Portrush, a new era for Irish golf. IT HAD BEEN golf’s worst kept secret for some time so confirmation of the Open’s return to Royal Portrush came as little surprise – yet it took nothing away from the magnitude of the announcement. The prospect of the game’s most prestigious event returning to the Dunluce links had surfaced twelve months ago but when The Royal & Ancient Golf Club (R&A) arrived on the north Antrim coast this week, the gravity of the occasion was tangible. Sitting side-by-side at the top of a crammed room in the clubhouse, Acting First Minister Arlene Foster and Deputy First Minister Martin McGuinness presented a united front. They spoke passionately and proudly – and from the same sheet. This wasn’t about politics or the past. It was about working together to deliver a legacy through the medium of sport. For the first time in 68 years, the Open – the British Open – will be played on the island of Ireland in July 2019. It will be just the second time The R&A have staged their flagship event outside England and Scotland. A decision of this consequence isn’t made lightly. This was years in the making but eventually, piece-by-piece, it all came together. Royal Portrush, along with Royal County Down and Portmarnock, is among Ireland’s most distinguished links. It is steeped in golfing history and heritage – but one of the country’s finest courses was in danger of becoming a sleeping giant. Something needed to be done. Not long before the Ryder Cup visited south of the border, Royal Portrush formulated a venturesome proposal. The aim was to attract major golf tournaments back to the area. It was a bold move, and a risk. It was, however, to safeguard the future of the club. As Chairman of the Championship Committee, Bamber has been been part of the process since day one. His phone has barely stopped ringing since Tuesday yet he’s more than happy to answer call after call for this is something he and his colleagues thought would never happen. “Before we even approached the R&A, the funding needed to be in place. The government were keen on supporting and investing in golf because it is a sport beginning to take centre stage on this island. Progress was slow but once the wheel began to turn, the campaign gathered momentum. The Northern Ireland executive duly delivered a financial package to underpin the project while the European Tour also lent its support. The foundations were now in place and the staging of the 2012 Irish Open at the famed Antrim links provided the persuasive evidence. Great to see The Open coming to Portrush in 2019. One of my favorite courses. It'll be a great challenge and a huge boost for Irish golf. Darren Clarke, Rory McIlroy, Graeme McDowell and Pádraig Harrington threw their weight behind the cause but actions speak louder than words. Royal Portrush needed to showcase its credentials and provide enough reason for The R&A to even consider broadening its horizons. Record crowds watched Jamie Donaldson win the Irish Open that week and it made The R&A sit up and take notice. The then chief executive Peter Dawson admitted it was an ‘eye opener’ and ‘tipping point’. The door had opened. “It was staggering,” Bamber says of the that week. “It was undoubtedly the catalyst for what we’ve gone on to achieve. “Perhaps attendances at previous Opens haven’t been what they used to be and we knew there was an opportunity there. We had a business model, we had the support of the Northern Ireland executive and we knew we could put a package together. In order to stage the Open, Bamber and the committee knew changes would have to be made to the links. There was a concern that redevelopment work on their beloved course wouldn’t sit easy with the members. But in August last year, members of Royal Portrush voted overwhelmingly in favour of making the required changes to bring the Open to their club. It was another box ticked. “They knew what this would mean for our golf club,” Bamber says. “It’s an incredibly exciting time but we weren’t sure if the members were prepared to be thrust into the limelight. If they were prepared to deal with the disruptions. Yet the club were cautious in their approach. The R&A is an organisation governed by tradition. A time-honoured institution, it only recently allowed women join as members. Cautious and conservative, rarely veering from convention. But times have changed. Golf has become a business and the governing body has had to adjust its commercial strategy to stay afloat – selling the TV rights to Sky Sports was the first indication of a changing landscape. The financial impact an event of this scale makes to the local economy is enormous. It’s estimated the Open will generate as much as £70 million. Local businesses are in for a significant windfall. Estate agents have been employed to locate high-class residential properties for players and officials while work has already begun to ensure the local infrastructure can accommodate the thousands of tourists expected to descend on the North. On the links, Martin Ebert will oversee the remodelling of the golf course. The work is due to be completed by next summer. It will be another significant juncture. “We need to get this right,” Bamber stresses. “No stone will be left unturned in our quest to ensure we produce the best golf course and provide the best experience for everyone involved. At a press conference to announce Royal Portrush’s place on the Open rota last summer, Dawson spoke of the ‘rich golfing heritage’ in Ireland. The players, the fans, the courses and the history – and the R&A wanted to be part of it. Then came Tuesday. Official confirmation that the sport’s most illustrious tournament was returning to these shores. A landmark announcement and seminal decision. A day for the ages. “It’s now our responsibility to fly the Irish flag, enhance our golfing reputation and represent the thousands of golfers, clubs and supporters on this island,” Bamber adds. The dream, the vision, of the members of Royal Portrush has been realised but it won’t be until early July 2019 that it actually becomes a reality. Until then, the hard work continues to ensure this truly becomes a new era for the club and for the sport on the Emerald Isle – both north and south of the border. It’s been an indelible week in the celebrated history of Irish golf but one which ensures there are so many more to come. Email “'We're proud to be representing the island of Ireland by hosting the British Open'”. 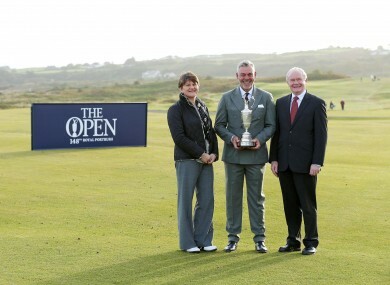 Feedback on “'We're proud to be representing the island of Ireland by hosting the British Open'”.